For the girls in the classroom, I decided to make chocolate butterflies for the cupcakes. I made my own butterfly templates, outlined them with dark chocolate, and filled/decorated them with different colored white chocolate. They turned out okay, but piping the small butterflies did not truly bring out the colors because I felt the outlines were too thick. I think next time, I will make a larger butterfly template so as to incorporate more details in the butterfly design. 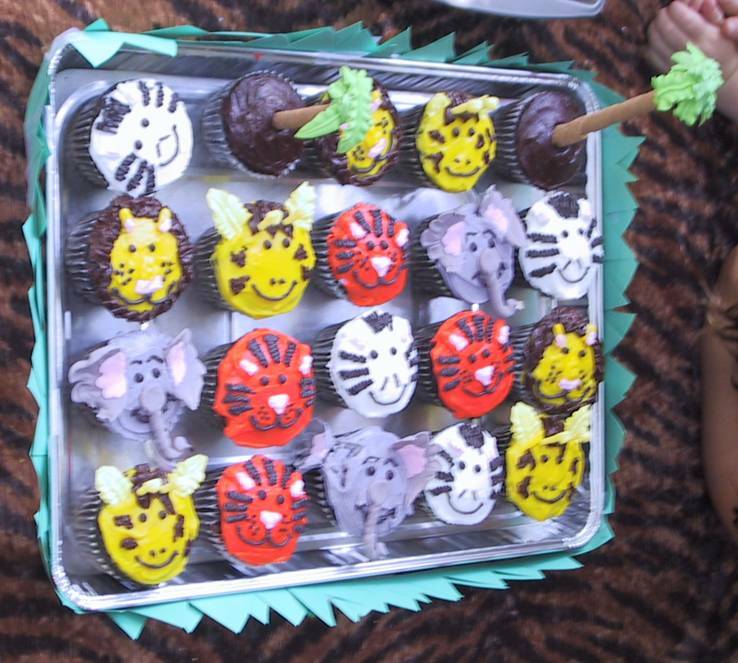 Regardless, I was up in the air to hear that the girls also liked the butterfly cupcakes. I made Spiderman cupcakes for a friend’s son’s birthday celebration. I originally toyed with the idea of creating spiderwebs on the cupcakes, then piping Spiderman faces, and finally decided to make Spiderman masks out of chocolate. I used a Spiderman face template, covered it with wax paper, outlined the face w/ dark chocolate, and then later filled in the eyes with white chocolate and the face with white chocolated tinted red. My senses were tingling with all the spidermen watching me working… I was happy the boys at the class party were thrilled w/ the cupcakes! I decorated ~40-50 cupcakes for the next party. It took quite a bit of time and transportation again was an issue. I decided to decorate the cupcakes at the party because I didn’t want them to get mangled in transport. 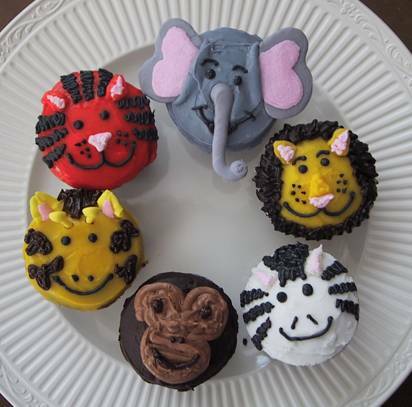 I made elephant, tiger, monkey, zebra, lion, and giraffe faces. I’m glad they were a hit with the kids at the party.